Saving Mr. Banks is a Disney film about a Disney film. So in the telling of the story of the behind the scenes of the making of the 1964 film Mary Poppins, both Disney and Walt Disney are of course prominently featured. 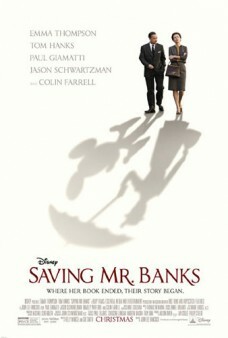 In Saving Mr. Banks, Walt Disney tries to persuade the author of the book, P.L. Travers, to let him turn her book into a movie. Separately and in flashbacks, P.L Travers’ reminisces about her childhood and the relationship she had with her father. Mr. Walt Disney (a perfectly cast Tom Hanks) flies in P.L. Travers (a very British Emma Thompson) to Los Angeles to, first, allow him to make her book Mary Poppins into a film (after begging her for almost 20 years), and secondly, to be there (and possibly help out) in the writing of the film, much to the dismay of the film’s songwriters – Richard and Robert Sherman (Jason Schwartzman and B.J Novak). 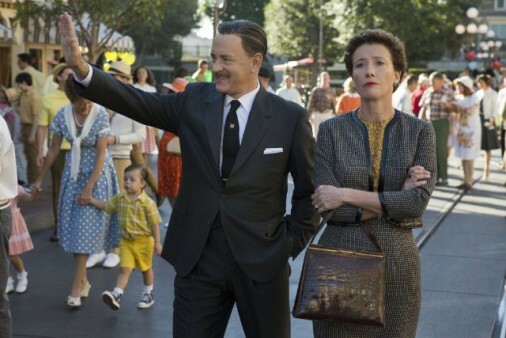 The other part of Saving Mr. Banks is the story of P.L. Travers herself as a little girl (played by the winning Australian Annie Buckley) who, with her family, lives on a farm in Queensland, Australia, with her mom (Ruth Wilson), and father Robert (a surprisingly good Colin Farrell), and his addiction to alcohol. Mary Poppins, if you have forgotten, is the story of a man, George Banks, who, with his suffering wife, Mrs. Banks, search for a perfect nanny for their two children, children who have a tendency to misbehave and run off (and no previous nanny could handle them). Mary Poppins flies in (literally) to take care of the children and to set them straight. (Pamela) P.L. Travers’ father was the inspiration for George Banks. Thompson depicts Travers as a very snooty British, stiff-upper-lip know-it-all woman. She is insulting (always putting down the Sherman brothers lyrics), rude (barging into Disney’s offices anytime she wants), and at one point goes back to England, leaving the production, and Walt Disney, hanging. It is up to Walt Disney to fly to London to get her formal approval for Disney to finish making Mary Poppins. She finally comes around (lucky for us). So snooty is Travers that in the beginning of the film, as she lands in Los Angeles, the first thing she says is that it smells like chlorine. On the other hand, there is no better actor in Hollywood to play Walt Disney than Tom Hanks. Hanks has a reputation as being the nicest person in Hollywood, and he plays Disney like he could be your own father who has the keys to the biggest candy store in the world. The part of Saving Mr. Banks where Travers is a girl in Australia is the best part of this film. It actually seems like a different movie altogether. Told in flashbacks while Travers is in Los Angeles, we see that her childhood was a good one, but unfortunately the father that she loved so dearly was a gambler and an alcoholic who could not take care of his young family. Buckley as a young Travers is amazing, as is Wilson as Margaret, her mother. Farrell, as her father, gives the best performance in this film as an ill-tempered yet loving man who really wants to take care of his family but cannot do so due to his addictions. The scenes play out like a dream sequence, they are very good. And then there is a woman who comes from the sky (not literally – she is an aunt) to help the family. Saving Mr. Banks depicts Travers weeping with tears of joy at the premier of Mary Poppins. But in reality, she did weep, with tears of horror, stating ‘Oh God, what have they done.’ So while Saving Mr. Banks is a good film, one that may make you weep, don’t let Thompson’s very negative portrayal of Travers and the fact that this film is not entirely the true story of the making of Mary Poppins put you off. It is definitely a film for the entire family, as all Disney films are. Saving Mr. Banks is good film for the whole family, like most Disney films are.